There’s nothing better than hanging out with your girlfriends by the ocean, unless of course you’re in a cabana. We spent the better part of our vacation in Grand Cayman inside a luxury cabana and couldn’t have been happier. This summer the Ritz-Carlton Cancun is offering the Beyond Beach package which gives you the use of a hand-built beach front cabana with a cabana butler and a personalized sign designed by an in-house graphic artist that will let everyone know who’s inside. The $349 per night rate includes a guest room with views of the Caribbean, daily breakfast for two, a beach bag full of amenities, and a farewell gift (we know what it is–and it’s super cool!). Valid May 1st through September 30th, 2009. 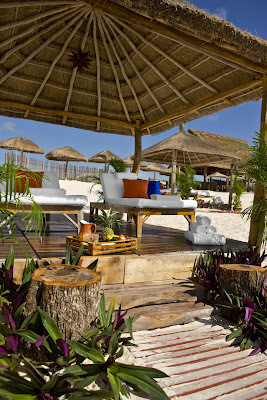 We look forward in indulging ourselves with a cabana on our upcoming trip to the Ritz-Carlton Cancun. We’ll let you know all about it!